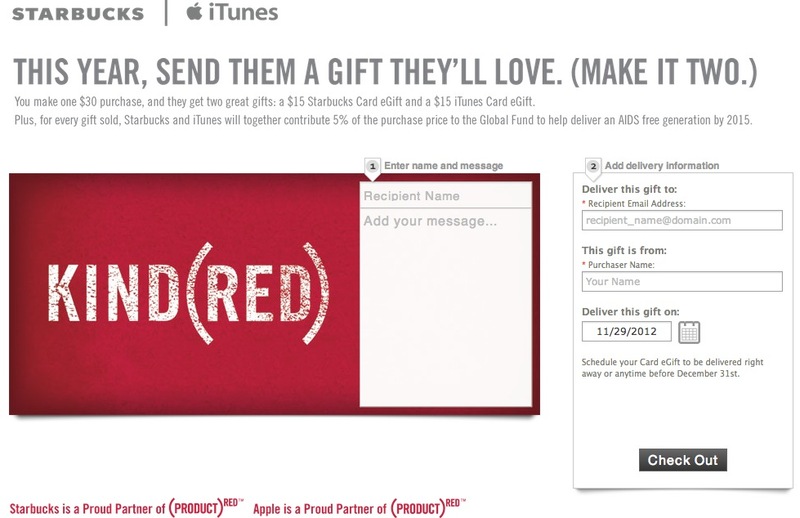 Starbucks and Apple’s iTunes are teaming up to offer a (Product) RED digital gift basket for $30 this year. The basket consists of a $15 gift card to each store, and 5% of the purchase price goes to the Global Fund AIDS research foundation. The gift basket was announced today and discovered by The Loop, and can be purchased here and sent to the recipient of your choice. That means that Starbucks and iTunes will each donate 75 cents to the Global Fund with every purchase. The cards can be used online or in store at Starbucks (online obviously for iTunes). Starbucks will also be donating 5c for every ‘handcrafted beverage’ sold in participating Starbucks on World AIDS Day, Saturday December 1st. Both Apple and Starbucks have been longtime partners of the (Product) RED initiative, which donates portions of products sold to AIDS research. Apple offers a variety of accessories like iPad Smart Covers under the RED banner. Starbucks has contributed more than $11M to the Global Fund since it’s partnership began in 2008.